Case: As part of a general presurgical evaluation, a 42-year-old man underwent radiography (Fig. 1). 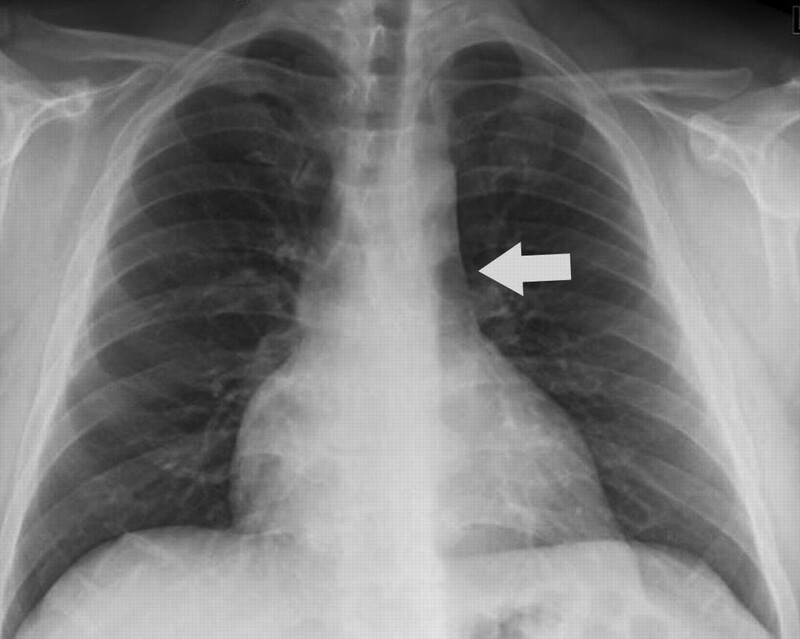 His chest radiograph showed mild cardiomegaly and enlargement of his superior mediastinum. 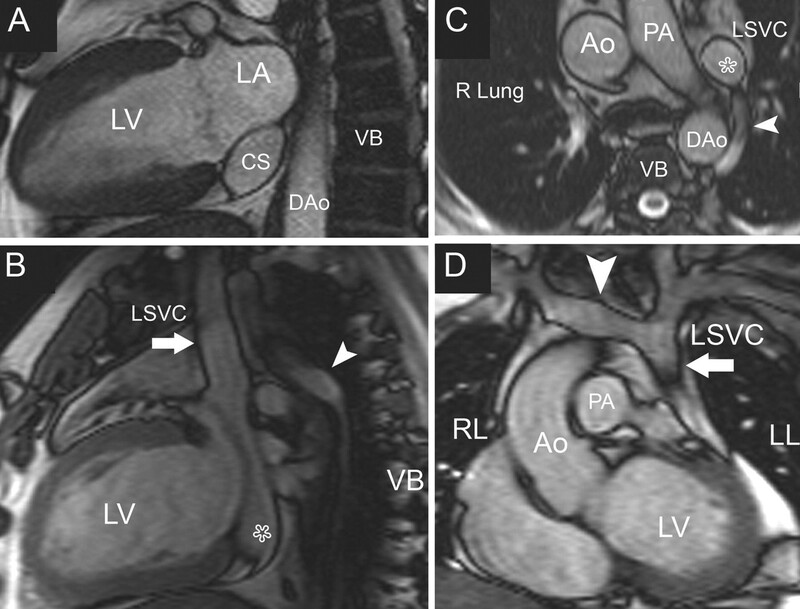 Cardiovascular MRI to assess his thoracic aorta and left-ventricular function revealed a mildly dilated left ventricle with normal systolic function, but also a coronary sinus (normally < 1.5 cm across) dilated to 4.5 × 2.7 cm in cross-section (Fig. 2A). The cause of this severe dilatation was found to be a left-sided superior vena cava (SVC) connected to the coronary sinus (Fig. 2B). The right SVC was absent; blood from the upper part of his body was transported to the right atrium through the left SVC by way of the coronary sinus (Fig. 2B, D). His thoracic aorta was of normal size; no other cardiovascular abnormalities were found. The surgical team was informed of the findings, and the patient's knee-ligament surgery was successful. Fig. 1: Chest radiograph, posteroanterior view. The vascular shadow (arrow) in the upper mediastinum, extending from the clavicle along the left margin of the aortic arch, reveals the left-sided superior vena cava. Fig. 2: Cardiovascular MRI, “bright blood” sequence. A. Scan of the cardiac 2-chamber plane: the coronary sinus is severely dilate. B. Thoracic sagittal plane: the left SVC (arrow) is connected to the cardiac sinus (star) and the left azygos vein (arrowhead) drains into the left SVC. C. Transverse plane through the upper thorax: the left SVC (star) and left azygos vein (arrowhead) are evident, whereas the right SVC is absent. D. Coronal thoracic plane: The innominate vein (arrowhead) connects the right jugular and subclavian veins to the left SVC (arrow). Ao = ascending thoracic aorta, DAo = descending thoracic aorta, LA = left atrium, LL = left lung, LSVC = left-sided superior vena cava, LV = left ventricle, PA = pulmonary artery, RL = right lung, SVC = superior vena cava, VB = vertebral body. Most physicians are generally familiar with the normal SVC and its tributaries. Blood from the head and neck travels via the external and internal jugular veins, which join the subclavian veins to form the right and left brachiocephalic veins. These in turn empty through a right-situated SVC into the right atrium. As embryos, however, our venous system is very different (Fig. 3, left panel). During the sixth week of development, the primary atrium receives venous tributaries from both sides of the embryo through the common cardinal (caval) vein, which connects the paired superior (which drain the cranial parts) and inferior caval veins (which drain the caudal parts). When we are only 8 weeks old (at around 10 obstetrical weeks), an innominate vein forms between the 2 SVCs. Fig. 3: The development of persistent left-sided superior vena cava (SVC). Left panel: The embryonic venous system, in which the superior and inferior caval veins (CVs) join into the common caval vein. At 8 weeks, the innominate vein links the superior CVs. Centre: The left superior CV normally obliterates distally to the innominate vein; the right-sided SVC develops from the right superior CV and part of the right common CV. The coronary sinus, which collects myocardial venous blood, develops from the left common CV. Right panel: A persistent left SVC connects to the coronary sinus. The right-sided SVC is absent because of persistence of the distal superior CV segment on the left and involution on the right. AntCV = superior caval veins, CCV = common caval vein, CS = coronary sinus, InV = innominate vein, LSVC = left-sided superior vena cava, PostCV = inferior caval veins. By the twelfth week of fetal age, the left SVC is normally obliterated and only the right SVC remains (Fig. 3, centre panel). The coronary sinus, which collects myocardial venous blood, develops from the left common caval vein, initially connected to the left superior and inferior vena cavae. This explains why the vein is connected to the coronary sinus in most cases of persistent left SVC. In rare instances there is involution of the right SVC along with persistence of the left (Fig. 3, right panel). It is not uncommon to find patients with a persistent left SVC draining into the coronary sinus along with a normal right SVC; this occurs in 0.3% of the general population and is considered a normal variant of systemic venous return.1 In such patients, blood from the left jugular and subclavian veins reaches the right atrium via a left SVC and the coronary sinus while the right brachiocephalic vein drains into the normal right SVC. However, it is fairly rare to find a patient such as ours, with a persistent left SVC in the absence of a right-sided SVC and with normal visceroatrial orientation (situs solitus), which occurs in less than 0.1% of the general population.2 Nearly half of patients with left SVC (46%) have associated congenital abnormalities (Box 1), which are often significant enough to be detected before or just after birth. 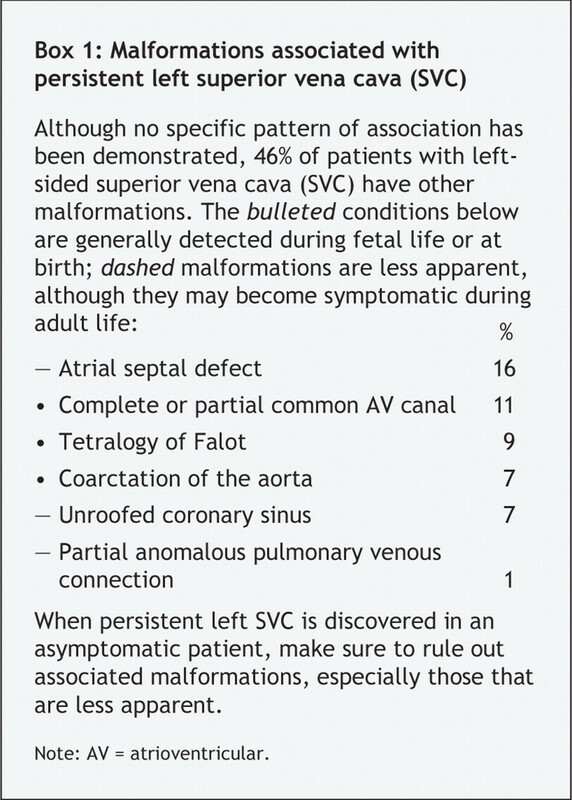 However, half of patients with a persistent left SVC and absent right SVC are asymptomatic and have no associated cardiac malformations. For an MRI animation of our patient's anatomy, see Appendix 1 (available at www.cmaj.ca/cgi/content/full/175/1/27/DC1). In such cases, other associated malformations such as an atrial septal defect or anomalous pulmonary venous return should be ruled out. Cardiovascular MRI, with its large field of view and unlimited imaging plane selection, is better suited to make the diagnosis than transthoracic echocardiography. In the absence of associated cardiovascular malformations, this condition is clinically asymptomatic. Edwards J, DuShane J. Thoracic venous anomalies. Arch Pathol 1950;49:517-37. Bartram U, Van Praagh S, Levine JC, et al. Absent right superior vena cava in visceroatrial situs solitus. Am J Cardiol 1997;80:175-83.